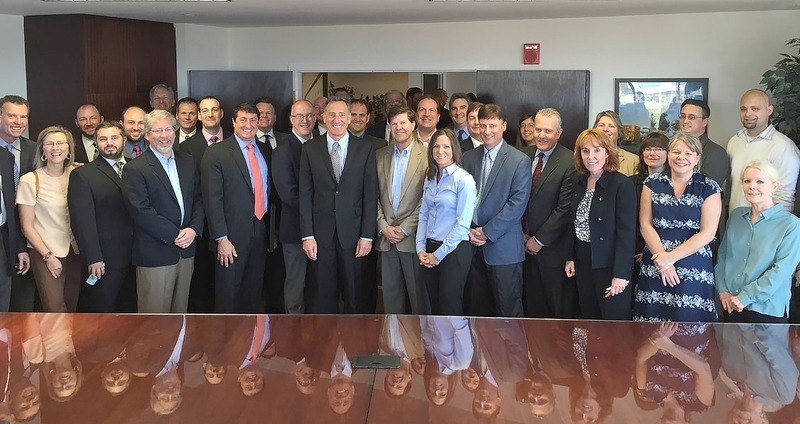 Vermont Governor Peter Shumlin signed the captive bill into law yesterday morning surrounded by a large contingent of Vermont’s captive insurance industry professionals. On a beautiful spring morning here in Vermont, the Governor talked about the importance of the captive industry for the State and thanked those in attendance for their hard work and dedication in keeping Vermont the leader on captive insurance for over three decades. The new legislation passed in the 2015 session strengthens Vermont’s captive legislation in a variety of areas including groundbreaking changes to the investment guideline in the minimum capital requirement and reducing the minimum capital requirement for sponsored cell captives. A complete copy of the bill as passed with amendments can be found at: www.vermontcaptive.com/laws-regulations/laws. This entry was posted in Captive Insurance, Insurance, VCIA and tagged captive bill, captive insurance, Governor Shumlin, VCIA, Vermont Governor Peter Shumlin, Vermont politics by vciablog2013. Bookmark the permalink.